The West Coast Mainline has seen considerable investment in recent decades and now offers the fastest domestic rail services in the UK. The journey between these two cities, which lie just over 188 miles apart, takes two hours and nine minutes with stops at Crewe, Wilmslow and Stockport in the winter 2012/3 timetable. Journey times for the slightly shorter route via Stoke-on-Trent are similar. Achieving an average speed of nearly 88 mph over a route constructed in the nineteenth century provides ample testament to the engineering. 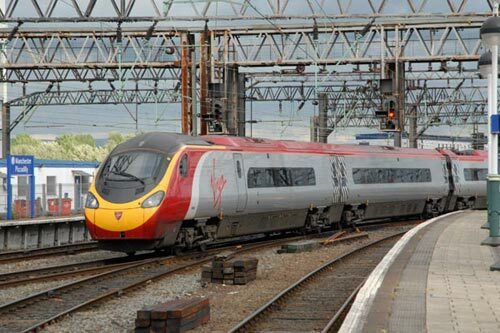 Photo - A Virgin Trains Pendolino arrives at Manchester Piccadilly from London Euston. The journey starts at a rather uninspiring Euston station where overuse of concrete in its construction has meant a characterless modern station. With an on time departure at 1240 the Virgin Pendolino tilting train was soon threading is way through the complex trackwork on the approaches to Euston diving into tunnels to gain the northbound fast line. The old loco roundhouse at Camden is seen on the right as the train starts to accelerate. Reaching Willesden you get a view of the ach spanning Wembley Stadium on the right before heading through South Kenton where a good view of Harrow on the Hill can be seen to the left. Watford Junction is soon reached with the train speeding through the busy station at maximum speed of 125 mph. Kings Langley is the home of Ovaltine with the factory on the left. Next landmark is Berkhamstead Castle which is the right as the train tilts into the curves through the station. Dating from Norman times the castle fell into ruins and was nearly demolished with the London to Birmingham Railway was built in the 1830s. Next landmark is Tring Cutting which was dug by hand with enough chalk excavated to fill Wembley station. Four kilometres long and twelve metres deep most rail travellers only notice it because they have lost mobile phone reception. Exiting Tring Cutting you have a good view on the right to the Chilterns with Ivinghoe Beacon the most prominent hill at the end of the ridge. Maintaining speed the train takes you through Leighton Buzzard, Bletchley to Milton Keynes which is one of a number of "new" towns on the edge of London. At Roade the line to Northampton disappears to the right and as the line meanders through the Northamptonshire countryside the tilting character of the train is used more frequently. Alongside on the right you will see the Grand Union Canal construction of which started in the 1790s. Linking London and Birmingham the rail route has followed considerable sections of the canal since leaving London. The M1 motorway comes in alongside the railway and you can appreciate the speed as you overtake cars and trucks on this busy road. Suddenly the train enters Kilsby Tunnel (2432 yards/2224 metres). Construction was hampered by quicksand and eventually opening in 1838 after a significant budget overspend. Rugby station speeds past the window and the route heads through Nuneaton and Tamworth. This is the Trent Valley line although the River is not crossed until after Lichfield. This small city lies to the left and the spires of the cathedral can be glimpsed as you speed by. The Power Station on the right indicates that Rugeley has been reached with the River Trent also on the left. In 1855 Rugeley was home to an infamous murderer, William Palmer. There was talk of renaming the town after this episode and the prime minister at the time Lord Palmerston agreed providing it was not named after him! Slowing for Colwich Junction the train bears left (the route to right taking the direct line through Stoke to Manchester). Almost immediately you enter the grounds of the Shugborough Estate with the house out of sight to the right. Shugborough Tunnel, with its castellated entrances, is the most northerly tunnel on the West Coast Mainline. Five minutes later and you reach Stafford once home to a thriving shoe industry. More pleasant countryside takes you to Crewe station with its rather unkempt Victorian infrastructure a reminder of its past glories in the development of railways. Leaving this busy junction there is little of note although you will get an excellent view of the Jodrell Bank Radio telescope on the right shortly after Goostrey station. Brief stops at Wilmslow and Stockport means that the end of the journey is near. Leaving Stockport you get a distant view of Kinder Scout the highest mountain in the Peak District National Park. Manchester Piccadilly station was refurbished for the Commonwealth Games and now ranks as one of the finest traditional stations in Britain.